Clean Streets LA is a city-wide effort to clean our neighborhoods. Clean Streets LA will distribute 5,000 new trash cans throughout the city over the next 5 years. These additional bins will bolster the efforts of Clean Streets LA by making it even easier to ensure that trash goes where it belongs. 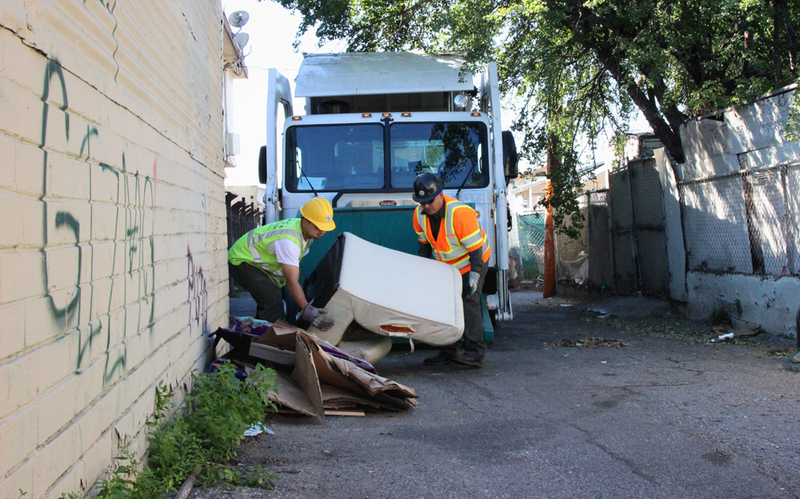 Clean Streets LA provides new funding to hire and train additional Sanitation crews who respond directly to bulky item pickup requests and reports of illegal dumping. This means more boots on the ground to do timely clean ups in the neighborhoods where they are needed most. A vital component of maintaining clean streets is making sure that people who illegally use our streets, sidewalks and alleys as dumping grounds are prosecuted to the fullest extent of the law. The Clean Streets Initiative empowers the City Attorney’s Office, LAPD, LA Sanitation, and Bureau of Street Services to develop new enforcement tools to fight illegal dumping in our neighborhoods. To more effectively track the cleanliness of LA’s streets, LA Sanitation has developed a state-of-the-art street-by-street cleanliness assessment system. With this new tool, Sanitation is better equipped to target areas of high need, and to ensure a fair allocation of services. Clean Streets LA is working with nonprofit partners to provide additional services, including weed, litter and graffiti abatement across the city, and to support community-driven clean-up activities.